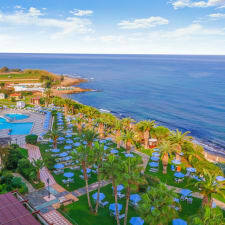 The Creta Star is an all-inclusive hotel on the wonderful beach of Skaleta. This 4-star hotel offers quality accommodation and great facilities for adults only in a pretty location. The hotel has 324 guest rooms, most of which have views over the sea. Each room is brightly decorated, includes a modern bathroom and features a balcony or terrace. All meals and selected drinks are included in the all-inclusive package at the Creta Star. Buffet-style meals are served in the main restaurant or at the snack bar and guests can enjoy a great choice of international food, plus of course many Greek dishes. In our Italian Restaurant during dinner you can enjoy our chef’s specialties, reservation required. Leisure facilities at the hotel include 2 swimming pools, 2 tennis courts, archery, mini-golf, one basketball stand as well as table tennis. Sauna and massage from our experienced cooperator are with charge. There is also an activity program which includes water aerobics, boccia and beach volleyball, plus evening entertainment. Also once a week you can enjoy our folklore group with music and dances from all over the country. The Creta Star has magnificent gardens that run down to its 400 m private beach. The resort of Rethymno is 12 km away.